This month is Women's History Month and we're celebrating by highlighting the contributions of women to the field of urban theory. In this post, we're concentrating on pedestrian plazas, which are a prominent public space feature of our sister district, the 34th Street Partnership. When it comes to the rules of the road, most of us tend to ascribe streets an almost monolithic function: to get cars from point A to point B in the fastest and most efficient way possible. This makes sense, right? When we're driving we want to get where we're going as fast as possible, so why shouldn't we design streets and intersections in ways that help facilitate that expediency? That's the same logic that has dictated official transportation policy in many cities for the last few decades, and it all rests on a base assumption that has gone unchallenged for years: that streets belong to cars. That was all until one urban visionary challenged the stasis by asking a simple question: What if we build streets for people? Before: Our neighbor district, the 34th Street Partnership, is a heavily trafficked retail hub, but also used to be major artery for vehicles. The intersection of Broadway and 34th Street by Herald Square had maintained a car-centric design even though it saw huge pedestrian use. 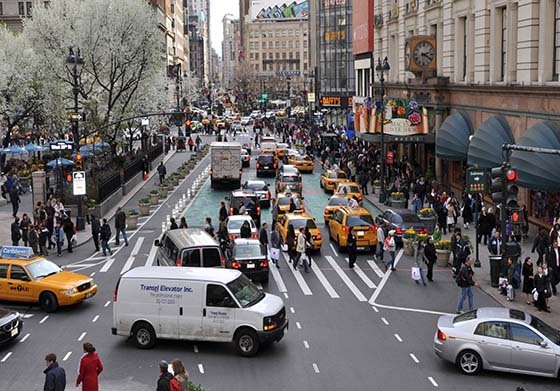 Janette Sadik-Khan served as the commissioner of New York City's Department of Transportation (DOT) from 2007 to 2013 and has radically changed the way we think about street design. According to a 2014 study, New York City has the largest percentage of car-free households of all major cities in the country. With all these pedestrians, reason stands that we should be designing safer and shorter cross walks, creating more dedicated space for alternate transportation like separated bike lanes, and re-sanctioning underutilized space for public plazas. 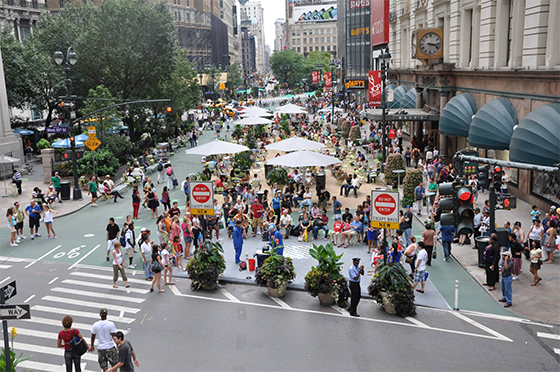 If you reexamine and retool the areas dominated by cars and give people new and open public spaces, they'll use it. While none of the ideas or concepts are new, the rate of adoption and implementation is what makes New York stand out, and is what elevated Sadik-Khan to urban celebrity status. Sadik-Khan led the charge in laying hundreds of miles of bike lanes and transforming largely trafficked commercial areas into public plazas within such a short time frame, that she forever transformed not only the streetscape of the city, but challenged the notion that urban change must be slow and fractional to be widely accepted. After: The pedestrianization of Broadway has created a much safer environment for pedestrians without detrimentally affecting vehicle traffic in the district. We are currently planning great free events from fitness to music in these spaces too. Critics consider her approach to be over-zealous. They believe that rather than moving full speed into these types of projects, we should do more critical studies and limited scale testing and research to assess any potential negative impacts these measures might have on traffic and drivers. To those points, Sadik-Kahn has said that “the new blueprint is … not anti-car. It’s pro choice.” Rather than taking away space from cars, we must also evaluate how drivers use space as well. By giving cars wider lanes, they're empowered to travel faster and feel less vulnerable to collision. But by slimming lanes we're not necessarily restricting cars' movement, but changing the attitudes of how they operate in that space and utilizing the additional area for alternative uses, not only making the streets safer for pedestrians, but for drivers too. Janette Sadik-Khan just released her new book, Streetfight: Handbook for an Urban Revolution, detailing her fight for more livable streets. We hope to see more of her ideas implemented not only in our district, but worldwide. Check out our other Women's History Month post celebrating Jane Jacobs' contribution to Bryant Park's operating philosophy.